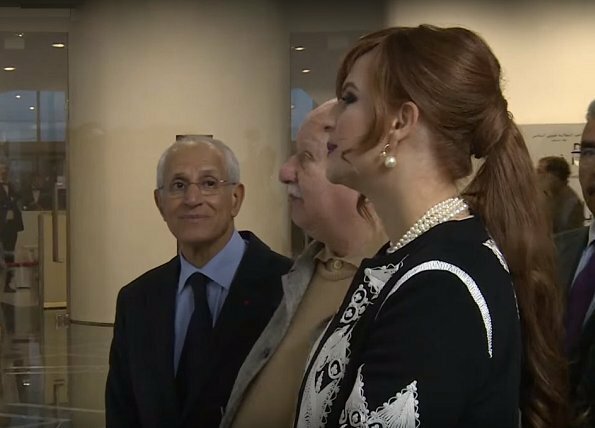 Princess Lalla Salma of Morocco visited Mohammed VI Museum of Modern and Contemporary Art (MMVI) in Rabat, Morocco and there, she presided a respect ceremony held in memory of artist Mohamed Amine Demnati. After this ceremony held on the occasion of 46th anniversary of death of Mohamed Amine Demnat and publication of the book, "Amine Demnati, vingt-neuf printemps, un été" by Maurice Arama, Lalla Salma visited the exhibition of some works of the deceased artist. That guy with the glasses is all of us. She is so beautiful! Irreconocible la hermosa Lalla Salma. Extraña ropa y maquillaje. I like her hair and make-up, although it is very dramatic for a daytime event and rather untypical for her. Her outfit is nice save for the white tights. A completely different, but just as stunning, look to see the Princess with straight hair instead of her usual waves of curls. She is so beautiful. Princess Lalla Salma is simply beautiful !!!!!!!!!! Very elegant !! I really love her straight hair !! Stunning! I also love her straight hair! She is such a beautiful woman! But what interesting pictures: one young modern woman amidst some elderly men in a muslim country. Change is coming.